Here at Dental Implant Solutionz, our highly skilled team takes pride in providing our patients with customized dental treatment. We take the time to listen to their individual wants and needs. We strive to provide our patients with an exceptional dental experience while achieving their dental goals. Dr. Tadros, Diplomat in the American Board of Oral Implantology/Implant Dentistry, specializes in all facets of dentures, implant retained dentures and periodontics and LANAP (Laser Assisted Regeneration). 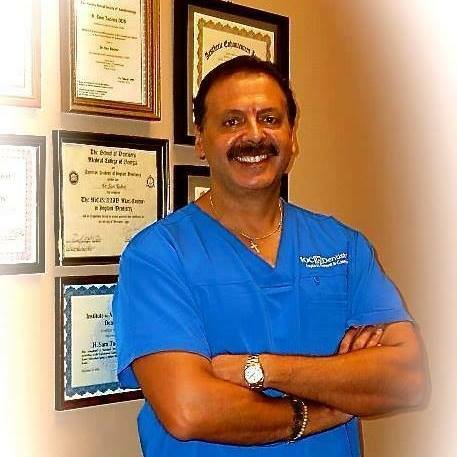 Dr. Tadros received his dental degree from the University of the Pacific, San Francisco in 1988 and his specialist degree in Prosthodontics from the University of Pittsburgh in Pennsylvania in 1992. My father was the first Dentist to place implants in the Middle East during the 1960’s. I graduated from my specialty training from the University of Pittsburg. I belong to a variety of organizations that focus on implant surgeries and restorations. Over the years I have seen many patients travel far and wide to have implants placed with unfavorable outcomes. With that being said, I have decided to focus my practice on providing implants and restorations of implants with the best possible outcome to my patients. Most importantly, really understanding what they want to achieve. Some of these cases can be a life changing thing!!! My goal is to make this as cost effective as possible so that no one has to travel all over the world to find prices they can live with. I enjoy spending my free time with my beautiful family. I am very lucky to be married to a kind, beautiful wife inside and out, and we have been blessed with three amazing daughters. I love and am so very proud of them all as they pursue their careers in the medical field. They sometimes drive me crazy but I would never change a thing. Prosthodontics is one of only nine dental specialties recognized by the American Dental Association (ADA). In fact, out of approximately 150,000 dentists nationwide, only 4000, just 2%, are Prosthodontists. A Prosthodontist, after completing four years of dental school, also completes three years of additional training in an ADA accredited post-doctoral program. In addition to an extensive clinical education, this training features an in-depth study of dental materials and related sciences, hands-on experience with all laboratory procedures, and collaboration with other dental specialists and medical colleagues. In these scenarios, the Prosthodontist becomes the architect for multi-disciplinary treatment planning and care. This scope of experience and educational focus distinguishes the Prosthodontist as the authority in the creation of tooth replacements that fit precisely, function optimally, and are biologically compatible. Prosthodontists are experts in the restoration and replacement of teeth- they make smiles look beautiful and the function the way they should. Prosthodontics is one of the nine dental specialties recognized by the ADA. Loss of natural teeth, whether in an accident or as part of the aging process, can be traumatic and affect your outlook on life. Simple pleasures- like smiling or going out to eat-become a source of stress or embarrassment. With the help of a prosthodontist, there are many options, if you have lost some or all of your teeth. Crowns, bridges, and full or partial dentures are just some of the procedures that can help you regain your smile and improve your appearance and self confidence. Dental Implant Solutionz offers a variety of implant treatments for restorations. Conveniently located in Largo off East Bay Drive and central to most Pinellas County zip codes, Dental Implant Solutionz offers a wide variety of dental services. Dr. Tadros is focused on implant , fixed and removable treatments that are implant based. Dr. Tadros also treats and educates his patients on preventive and restorative dentistry . Our experienced, caring and dedicated team offers quality care for each patient and thoroughly discuss treatment plan options that are custom to their individual needs. Our staff of hygienists, dental assistants, and administrative personnel is part of what makes our practice so successful. With decades of experience under their belts, our team is passionate about bringing quality dental care to every patient that walks through our door. We are proud to have a staff of professionals who make our office a friendly and welcoming place to patients of all ages and their families.